I woke to the sound of miniature cement trucks and jackhammers. 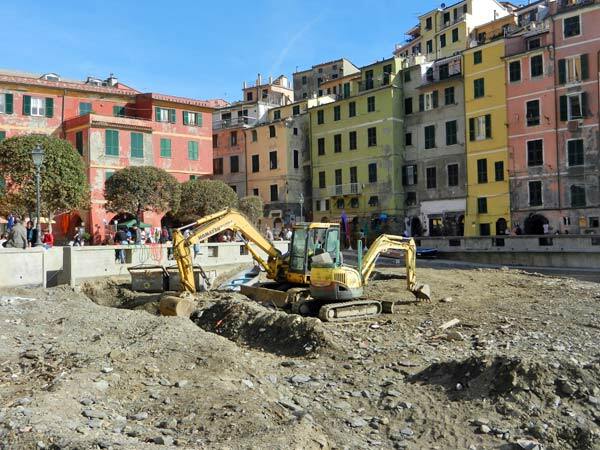 These were happy sounds to me, as physically, Monterosso and Vernazza are being put back together after the recent devastating flood. Socially, too, it’s been a time of reconstruction for both communities. Being small towns, they were rife with cliques and ancient grudges. With the challenge presented by the flood and recovery period, locals marvel at how everyone came together. Today, many locals enjoy better relations with old enemies, but there is a new divide: between people who joined in the community-wide effort, and those who only took care of their own business needs (or even left town during the chaos). In both towns, while a large percent of the businesses were essentially destroyed, lots of people and hotels that were on higher or luckier ground came through unscathed, losing only their water and electricity for a while. Some of them ignored their business needs and became heroically involved. And, as it goes in small towns, those who didn’t will long be remembered for turning their backs on neighbors in need. People commented on how, having experienced this tragedy, they have a new empathy for distant people dealing with similar natural disasters. Others commented on how, now, every time there’s a big rain, anxiety sweeps through the community. The tourist business in 2011 was very strong. October 25 was at the end of the season, when locals were ready for a much-needed winter break. While the flood hit at the perfect time from a business point of view, locals, already exhausted after a very busy season, had to immediately plunge into a nonstop rebuilding period, pushing to be ready for the 2012 season. 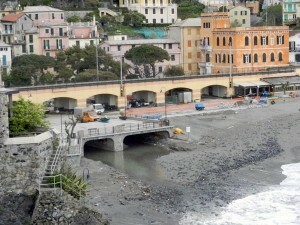 Vernazza's beach is swollen by mud from surrounding hills. Soon the hard-working tractor will be replaced by lazy sunbathers. For travelers wondering if it’s OK to travel to the Cinque Terre, here’s my take: Three of the towns were unaffected (Riomaggiore, Manarola, and Corniglia). They have plenty of tourism and don’t need your business as much. I’d choose between the two flood-ravaged communities. Monterosso is completely ready. Vernazza, with a few hotels and restaurants already open, expects to be ready for prime time by June. Crews have worked tirelessly to get the trails put back together and the best hikes are wide open. This is a great time to visit, to both stoke and celebrate the recovery, and to be one of the first to enjoy the charms of either town, post-flood. There’s a camaraderie in the air and an appreciation of tourists that is palpable. Even in late April, over the course of several days, I saw countless travelers enjoying their visits as they would if there had been no flood. 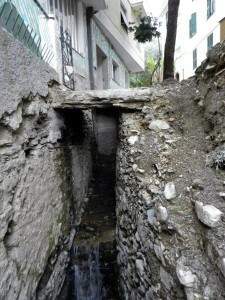 Monterosso: Overloaded drainage canals and ancient streams swollen under the streets caused pavement to burst upward. 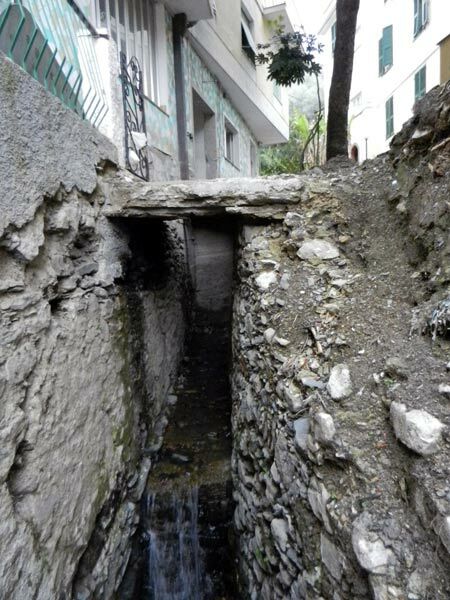 Monterosso's six under-street channels stand ready to allow future floods to flow unimpeded through town and into the sea without taking businesses and dreams with it. Groups of expat American women (who fell in love both with the towns and their men) are helping organize relief and communications in the aftermath of this disaster Rebuild Monterosso and Save Vernazza. For all the latest in both towns, see these websites or reach them through our Cinque Terre News page. Can you share a few more recent pictures of Vernazza from your latest trip please ? Thanks in advance !!! When you eat the fruit, remember who planted the tree. Vietnam saying. hi do you have a picture of the seaside in monterosso? is there still the sand or not ? If you are going to hike between Monterosso and Vernazza you prlobbay want jogging shoes / hiking boots. I’m not sure what flat canvas shoes are. The path is lots and lots and lots of stairs and in some parts it can be very narrow (especially when people are passing in the opposite direction) / uneven ground and not always is there a fence to stop you from falling. Carrying a shoulder bag is personal preference really. If you don’t have much in it it won’t make much of a difference. It would get annoying if you have lots in there. I saw some crazy, crazy people carrying their entire pack for the trip on their back. Like they were walking to their hotel/hostel via the path. Also this may be me rambling but I think you will have a better time if you are comfortable than if you worry about whether you look like a tourist. I understand where you are coming from, I used to think things like that too. But now, I think if anyone *really* takes note of you and what you are wearing (or cares for that matter) they can prlobbay tell where you are from generally anyway. So relax and enjoy the awesome views. Cinque Terre is fabulous.